The Michigan Vegetable Council has long supported vegetable crop research and education through grant funding. This funding is made from annual operating funds, as well as from the Council’s endowed research and education fund – the Michigan Vegetable Council Fund. In addition, the Council was successful in obtaining Specialty Crop Block Grant funding of $306,100 over the last three years to support vegetable crop research. The Council posts its annual Request for Proposals on the Michigan State University AgBioResearch website. The request for the coming year is posted each November. - Phytophthora capsici: Many vegetable crops, including all vine crops, tomatoes, peppers, eggplant and snap beans, are susceptible to phytophthora capsici. Once in a field, this disease persists even when non-susceptible crops are part of a rotation. - Soilborne diseases on asparagus, root crops, and snap beans: Fusarium (asparagus, snap beans), rhizoctonia (root crops and snap beans), phythophthora (asparagus, root crops), and pythium (snap bean and root crops) can impact yield and quality if not controlled, but effective management practices are lacking. - Cucurbit downy mildew: Downy mildew has been a significant problem in Michigan every year since 2005. Pickling and slicing cucumbers have been the crops most impacted, but all cucurbit crops are susceptible. The pathogen has shown resistance to several fungicides that had previously been effective. Given this development and the already high cost of control, downy mildew threatens the future of Michigan’s pickle industry. - Bacterial diseases on tomato and onion: This disease threat is difficult to control once established in a field and can cause significant economic losses. 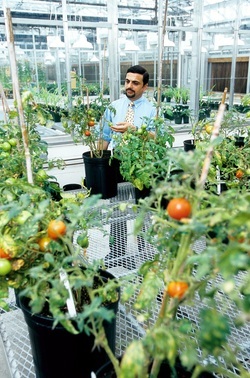 Infections may occur through contaminated seed (onion and tomato), in the greenhouse with seedlings (tomato), and in the field (onion and tomato). Bacterial blight on onion is a relatively new problem. Research and education to help growers manage these and other disease threats are vitally important to Michigan’s vegetable industry. Longer term, varietal resistance to these diseases is needed. - Predictive modeling: Predictive models that can be incorporated into the MSU Enviroweather system to help growers time control measures. - Insecticide resistance: Insecticide timing and rotation is critically important to maintain the viability of EPA registered products. - Invasive species: A rapid understanding of the biology, distribution and control of invasive insect pests such as Brown Marmorated Stick Bug or others. - Chemical controls: Testing and registration of new chemical controls with low impacts on the environment and beneficial insects. - Cultural and biological controls: Improved understanding of the effect of crop rotations, cultural practices and beneficial insects on pest populations. - Nematodes: Improved understanding of species present, distribution and control. - Chemical controls: Testing of herbicides that could be registered for vegetable crops to improve available chemical tools. - Other control methods: Develop and integrate mechanical, cultural and biological approaches to managing weeds. - Resistant weeds: Identify and address risks associated with herbicide resistant weeds including Powell amaranth and marestail. - Varieties: Development and testing of varieties for pest resistance or tolerance, higher yields and marketability. - Weed control: Testing of chemical controls that could be registered for vegetable crops to improve the tools available for weed control. - Nutrients: Improved nutrient management to reduce costs, improve yield and quality and reduce runoff or leaching. - Cover crops and rotations: Develop practices that will improve nutrient cycling, reduce pests and control erosion. - Irrigation: Test and educate growers on methods to efficiently use overhead and drip irrigation, including the use of fertigation and chemigation, to improve crop yields and quality. Soil impairment is a limiting factor in crop productivity. Inputs including technological innovations may boost yields relative to past performance, but if the soil is not in optimal condition, stress on the plants exacts a toll. Growers are aware of this relationship and are increasingly seeking soil analyses to determine precise data for representative fields. However, the biodynamics within the organic portion of the soil are still not adequately understood, and soil management suffers as a result. Many growers now perceive a need for a stronger grower-university partnership to expand soil research and demonstration projects applicable to the broad spectrum of vegetable crops grown in Michigan. The production and marketing of safe food is important to both consumers and producers. Food safety problems impact all growers of the affected crop. Growers will need to practice production and handling practices to help assure a safe food supply and to comply with the Food Safety Modernization Act.